The Wigwam is a golf and tennis resort located on the southwest part of the Greater Phoenix area. About 30 minutes from Sky Harbor Airport, it is set apart from the Phoenix and Scottsdale resorts, making it a favorite for people who prefer to be closer to West Valley attractions and activities. This resort positions you well for NASCAR at Phoenix International Raceway; Arizona Cardinals, the Fiesta Bowl and the College Football national Championship at University of Phoenix Stadium; Arizona Coyotes hockey and concerts at Gila River Arena; and spring training baseball for the Dodgers, White Sox, Padres, Mariners, Royals and Rangers. The grounds at The Wigwam provide a welcome respite from the desert rocks and common desert plants that locals see every day. For all you visitors, there is a cactus garden here! Most of the property, however, is about grassy lawns and open spaces. By the way, if you happen to hear or see fighter jets whizzing by, keep in mind that The Wigwam is very close to Luke Air Force Base. No need to panic. Various outdoor spaces complement the ballrooms and meeting spaces making this a popular location for outdoor weddings and other special functions. 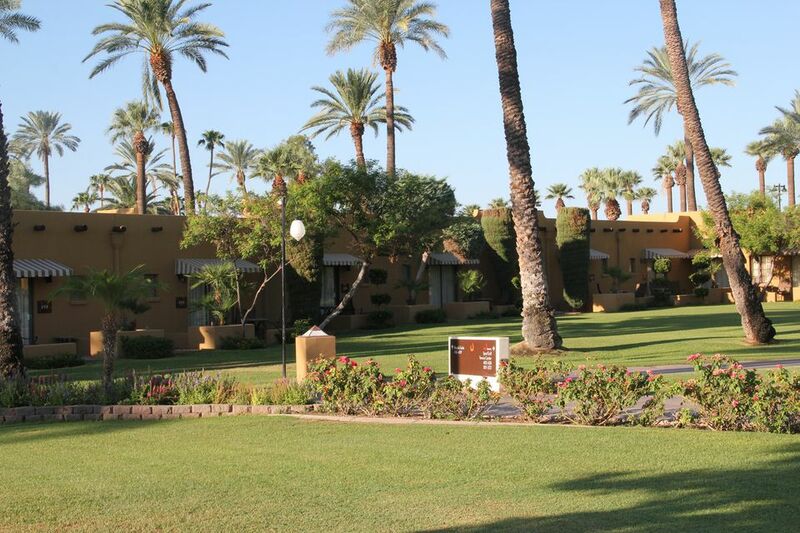 Many of the walkways at The Wigwam resort are lined with rose bushes. By the time August rolls around, those rose bushes have had enough of the heat, but they will be happy again in just a couple of months and bloom through most of the year. Meanwhile, you'll still find some desert blooms here, as exemplified in the photo. This bloom is probably one of a cereus variety. The artwork, furniture and accents at The Wigwam pay tribute to the history of the resort as well as the community which it has served for decades. Recent renovations at The Wigwam have placed special emphasis on outdoor spaces. Conference attendees, wedding and special events guests, and anyone staying at the resort can find comfortable outdoor areas to relax, have a glass of lemonade or wine, or chat with a friend or associate. Whether you are eating breakfast or enjoying great happy hour deals, you can choose to enjoy your snacks and beverages outside at The Wigwam Bar. All the public outdoor spaces at the resort are nice, but you might find that you'd like a little quiet private area of your own to enjoy a cup of coffee or a book. You'll have just that right at your room. During my visit I stayed in an Adobe Traditional Room. Larger than most deluxe king hotel rooms, there was a desk with chair as well as a table with two chairs. That means there were four comfortable chairs in the room. I appreciate that! The Lodge Pool, nearest to the lobby, is two pools in one. The side that attracts the younger crowd has a double water slide. It's fast -- tried it! There is a bridge that connects it to what is referred to as an adult side, although there is nothing that keeps children on one side or the other. The Lodge Pool is also the location for dive-in movies, when those are scheduled. The zero-depth area for the little kids ( and some adults, too!) has a cycle of different splashes, pop-jets and sprays for cool fun. It is located at the Lodge Pool, considered the family pool, right near the waterslides. It was a beautiful summer day when I visited the Lodge Pool at The Wigwam, and the view from my lounge chair was so pleasant! All the chairs at the Lodge Pool are of the chaise lounge variety, although I wish there were some regular chairs; I like to read sitting up! I visited the resort in the summer, so I was pleased at the number of umbrellas around the pool providing some shade. The staff also provided everyone at the pool with a pitcher of ice water. Very thoughtful and appreciated! The cabanas are located at The Lodge Pool, on both the children's and the adult sides. The lounges on the adult side are more padded than on the children's side! Cabanas here have an overhead fan and a small refrigerator. There is a table with chairs, suitable for eating, reading or playing cards or a game, inside the cabana. There is no television here. Outside, with an umbrella, are two lounge chairs. Your cabana rental comes with bottled water and a snack. In my case, it was a fruit plate which was a welcome summer treat. There are no cabanas at the Oasis Pool. For those that want a quiet pool and a spa, the Oasis Pool is probably the place to stake your spot. No cabanas, no ice cream bar, no water slides, no splash pad, no bar. It's just a quiet place to take a dip and swim a few laps. You don't have to be a golfer to love The Wigwam, but it doesn't hurt! Three 18-hole championship courses provide an appropriate experience for all levels of golfers. People come from all over the Valley of the Sun to golf here, where the courses are just as nice as many of the Scottsdale courses but the rates are more reasonable. Note: Golf carts do not have GPS. While we were provided with ice in a cooler (it was over 100 degrees) no water was provided. The Patriot Course is the easiest of the three courses, with wide fairways and more par 3s. That means that your short game will be challenged! Hole #15 is an island green. My shot was just inches too short -- in the water I went. But I have an excuse. Lots of excuses. Oh, never mind. It was a hot summer day to be playing golf, so i was pleased that The Patriot Course at The Wigwam only took two of us about 2-3/4 hours to play -- and we had to wait on several holes for the group in front of us. Tip to long hitters: when there are many par 3s that are pretty well bunkered, accuracy is more important than distance. You might be able to whack that tee shot, but you'll be in trouble here if distance is all that makes you happy. The pro shop at the Wigwam's golf course has a nice assortment of items for both men and women. Yes, I went shopping.If you are staying at the resort, don't forget to ask for a discount on goods purchased at the pro shop. Two people can play, or you can play in teams. Bocce is an ancient ball game that is gaining in popularity. Anyone can play and have fun! You'll find this regulation bocce ball court in the outdoor area just outside the Wigwam Bar. In addition to the stadium court shown here, there are eight other hard-court tennis courts available for resort guests and locals who are members of the tennis club. Litchfield's at The Wigwam is the signature dining experience. With an open kitchen, a community table and both indoor and patio seating it doubles as both fine and casual dining. Pictured here is the Cast Iron Duck Breast with Rhubarb Pie, an unusual presentation of duck which I enjoyed. It would leave some people hungry if not preceded by a salad or an appetizer, or followed up with a dessert. Not to worry -- I did both! The Gnoccho Carbonara was a delicious appetizer, and the Goat Cheese Cheesecake is my recommendation for dessert. Red's Bar and Grill is a very comfortable and casual eatery at The Wigwam's golf course. It's easy and free to park here, and it is a favorite watering hole for locals who are members of the golf club, as well as other locals looking for a great burger and fries or a cool place to watch the game on TV. Of course, resort guests are welcome. There are regular tables, hi-tops and a large comfy outdoor patio overlooking the golf course.